The beautiful cool blue of the sky is captured in Blue Topaz gemstones. This pastel blue gem is a designer favorite since it is affordable and available in a wide range of gem shapes and sizes. Its bright and lively color looks right set in both yellow and white metals. You'll find that this versatile gemstone complements almost everything in your wardrobe, from browns and grays to vivid tones. Blue was once the rarest color of Topaz, but today it is the most common, thanks to a stable color enhancement process developed in the 1970s. The popular icy pastel blue color is created by exposing colorless Topaz to irradiation and then heat. Lighter colors like Sky-Blue color are created by electrons and the darker blue known as London or Swiss Blue is created by exposure to neutrons. The process can take minutes or years, as high-energy processes require that the topaz is stored before it can be released safely. The pale or colorless Topaz used in the process is mined in Brazil , Sri Lanka , Nigeria , and China . The gemstones are usually cut before they are treated. Legend says that Topaz dispels enchantment. The ancient Greeks believed that a Topaz gemstone has the power to increase strength and make its wearer invisible in times of emergency. Topaz gemstones ewre also said to change color in the presence of poisoned food or drink. In 1969, Blue Topaz was named the state gem of Texas to celebrate a small deposit of natural pale Blue Topaz that was found in the state. Because Blue Topaz is readily available and affordable, it can be found in a wide variety of shapes and sizes, including unusual cuts. Large dramatic gems are readily available. Topaz is a very hard gemstone, but it can be split with a single blow: A trait it shares with diamond. As a result it should be protected from hard knocks. Clean with mild dish soap: Use a toothbrush to scrub behind the stone where dust can collect. 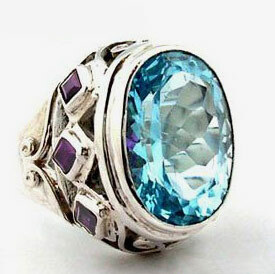 We offer you great Blue Topaz gemstones with best quality at wholesale prices! Check out our online-shop! Buy Sky Blue Topaz online - Buy Swiss Blue Topaz online!